It’s game day! 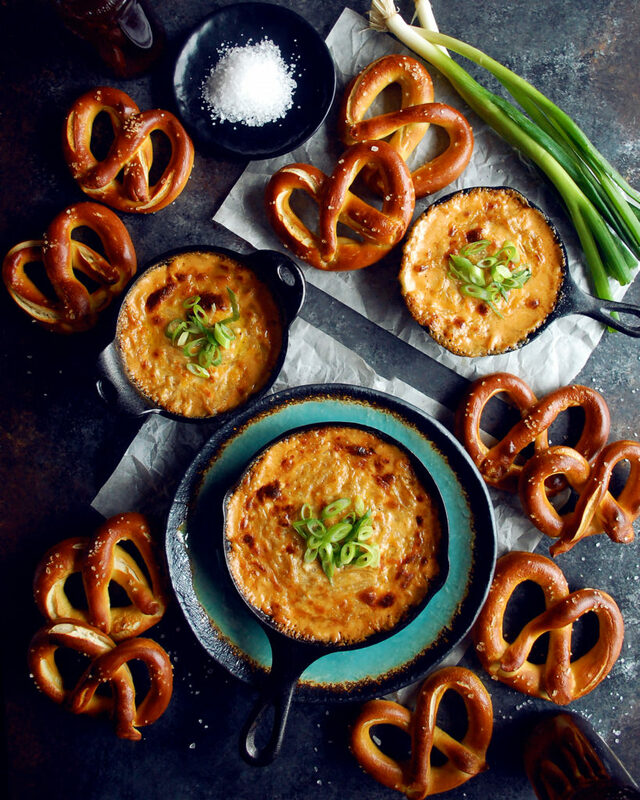 I’m gearing up for the super bowl with some homemade pretzels and a seriously delicious dip to serve with them. I mean who wouldn’t love to sit down to a football game with a big spread of THIS in front of them. Warm, freshly baked pretzels, slightly soft and salty. 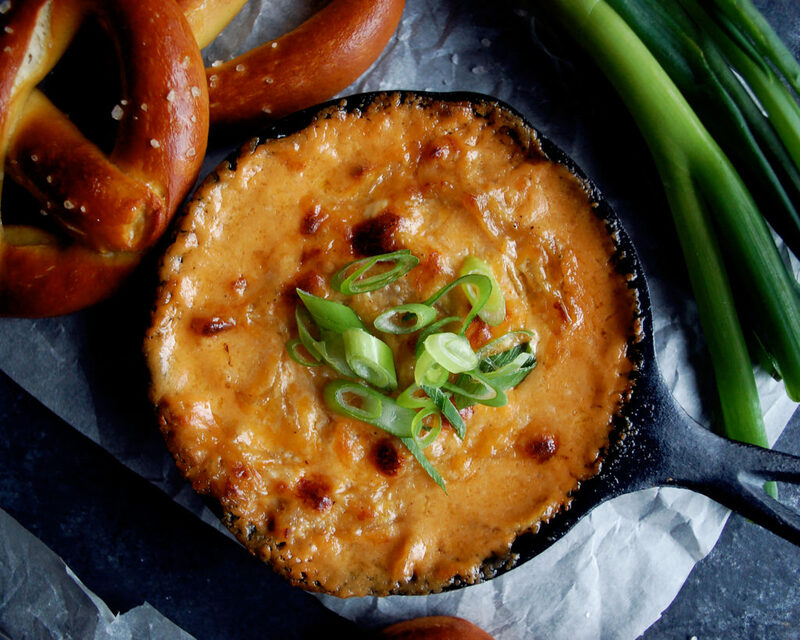 And a bubbling, golden brown skillet of beer braised onion & cheddar dip. Everyone will go nuts. Let’s start with the pretzels. I learned to make these about a year ago, and the process is honestly easier than I remember. I’ve adapted it a little to make it very kitchen-friendly to make at home. The dough is mixed, formed into a ball, and left alone to proof. You want to find a warm spot in your home for ideal proofing. Make sure to take notice what the dough ball looks like to start. You then want it to double in size. I’ve noted in the recipe that this will take about an hour. However, depending on the temperature of the room, it might take longer. Once the dough ball is doubled, it’s time to cut, roll, and shape. This takes a little practice to get used to, but just follow the method I’ve outlined in the recipe and you should get the hang of it pretty quickly. The pretzels then get a quick dip in a boiling mixture of water and baking soda. After that, I add some egg wash for color, course sea salt for flavor, and it’s into the oven they go. Now, the dip. It’s pretty self-explanatory, even though I go into a good amount of detail about caramelizing the onions. It’s all about temperature control. 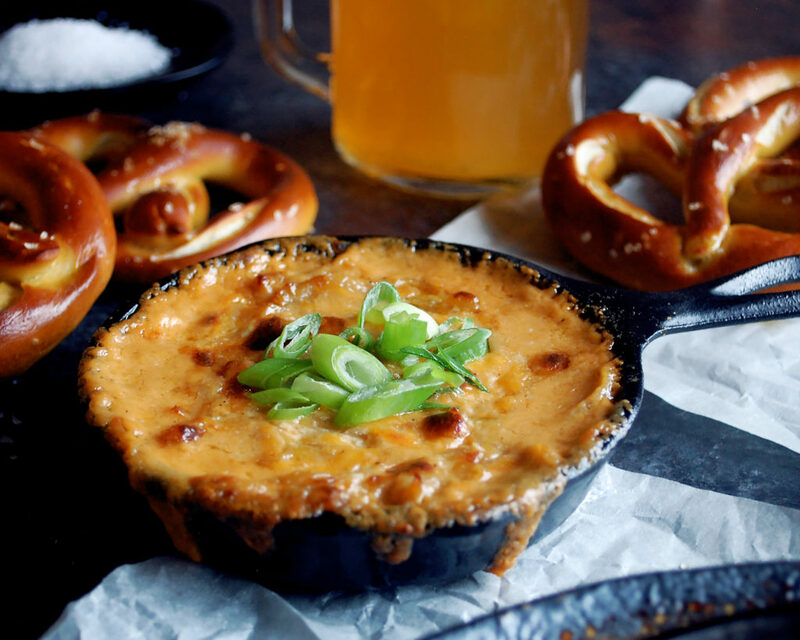 The beer deepens the flavor, and is the perfect game-day addition. 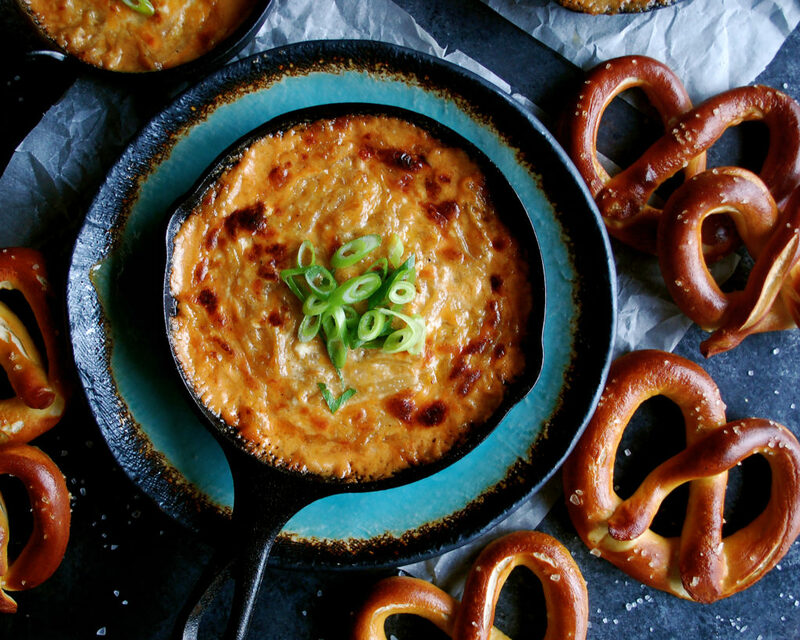 A few other simple ingredients, and this dip comes out of the oven smelling…and looking, like a winner. Enjoy! In the bowl of a stand mixer, combine the yeast and cold water. Let sit for 5 minutes until the yeast dissolves. Add the sugar, melted butter, flour, and salt. Using the dough attachment, mix on low speed for 3 minutes. Turn the speed up to medium, and mix for 5 more minutes. (Be careful that your stand mixer does not fall off the counter. The mixing process can cause some movement to occur.) Once done mixing, the dough should have formed a ball, and the sides of the bowl should be clean. Lightly oil a large bowl (or use the same one you mixed the dough in). Form the dough ball into an even circle, using your hands to pull the sides of the ball down and under to tighten the shape. Place the dough ball into the bowl, cover with plastic wrap, and let proof in a warm place for 1 hour. Check that the dough ball has doubled in size. If it hasn’t, let it proof longer. Preheat the oven to 450F. Remove the dough ball from the bowl onto a lightly oil work surface. Cut the ball in half, and then cut each half into eighths. Take one piece of dough (keep the rest covered so it doesn’t dry out) and roll it between your hands. Place it onto the oiled surface and roll it out into an 18” rope. Create a “U” shape, cross the ends, pull the ends down to the bottom, and pinch the dough shut to create a pretzel shape. Gently transfer each one to a parchment lined sheet tray that’s been rubbed with oil (the oil is important or else the pretzels will stick). Repeat the process with each piece of dough. 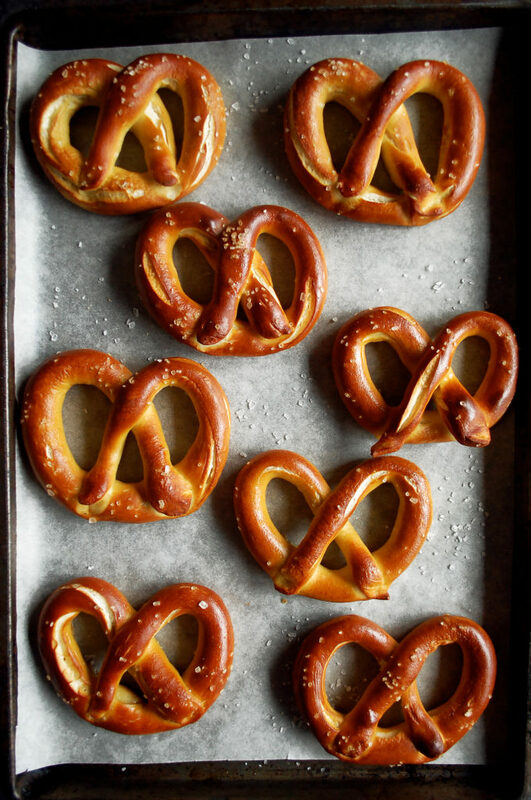 While you shape the pretzels, combine the 1½ quarts of water with the baking soda in a large pot. Bring to a boil. Place each pretzel gently into the water, one by one, and cook for 30 seconds. 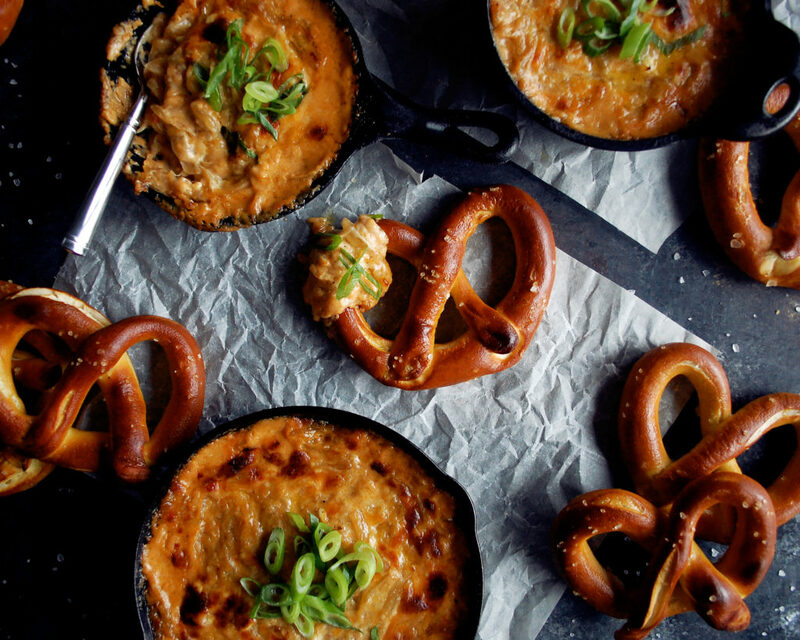 Transfer the pretzel back to the baking sheet using a flat spatula. 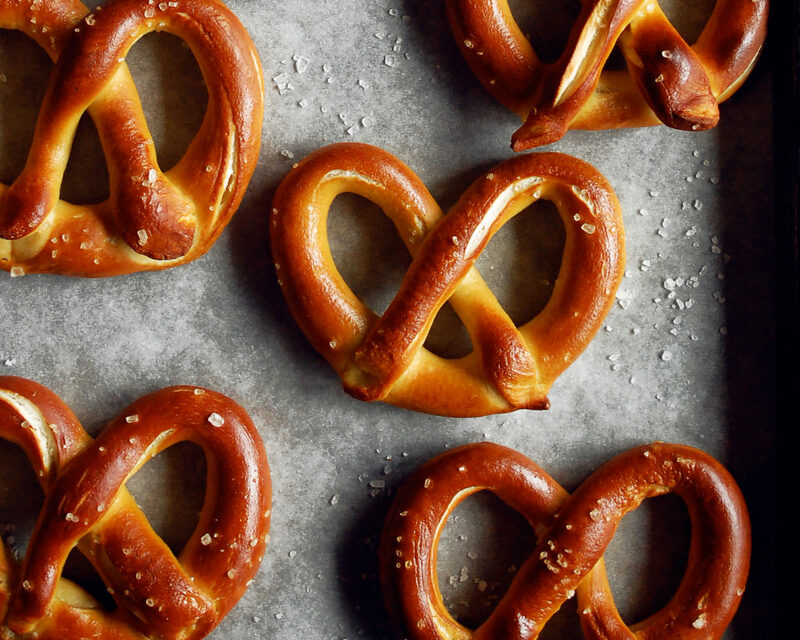 Once all the pretzels have been boiled, whisk together the egg and 1 tablespoon of water to create an egg wash. Brush the egg wash onto each pretzel. Sprinkle with course sea salt. Bake the pretzels for 10 minutes. Meanwhile, heat two large pans over medium-high heat. Add enough vegetable oil to each to coat the bottom of the pan. Divide the onions between the pans. Cook for a few minutes until softened, stirring often. Season with salt and black pepper. Lower the heat to medium-low. Cook the onions even further. Once they have some good color, drop the heat to low and let them finish cooking, stirring occasionally, for about 45 minutes. You want them to be a deep, golden brown color, extremely soft, and they should have shrunk in size considerably. Consolidate the onions into one of the pans and add the garlic. Turn the heat up to high. Stir in the beer. Let the beer come to a boil and cook for about 3 minutes. Drop the heat to a simmer and continue to cook until the liquid is reduced. Once there is not much liquid left in the pan, cut the heat and let the mixture cool. In a mixing bowl, whisk together the cream cheese, dijon mustard, cayenne, and mayonnaise. Fold in the onion mixture and cheddar cheese. When it’s time to serve, spread the dip into an oven-safe dish (I split mine into 3 small cast-iron skillets). Bake in the 450F oven until bubbling and golden brown, about 12-15 minutes depending on the size dish you use. 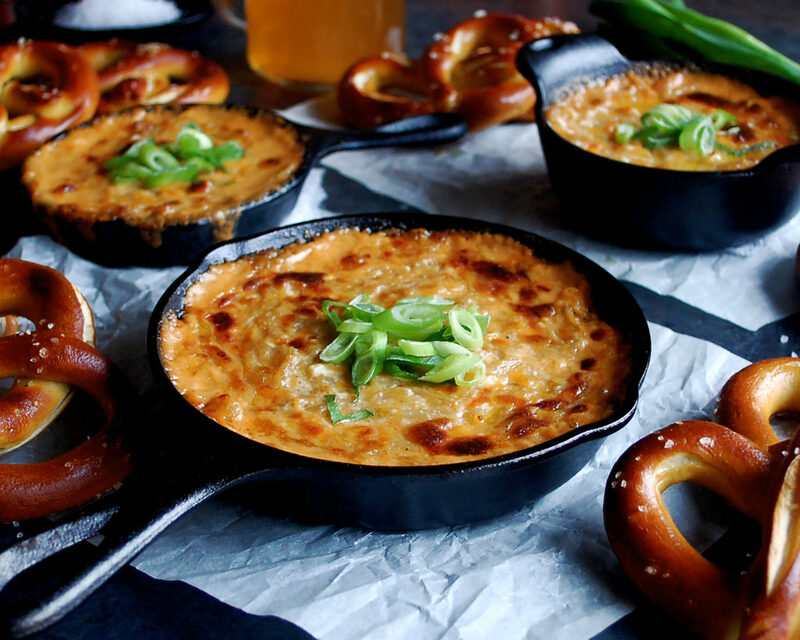 Serve the warm pretzels alongside the hot, bubbling dip. Sprinkle the green onions on top. Woooah, this looks DIVINE. Now I need to find an excuse to indulge in this! Thank you!! It honestly is so indulgent, but so worth it. 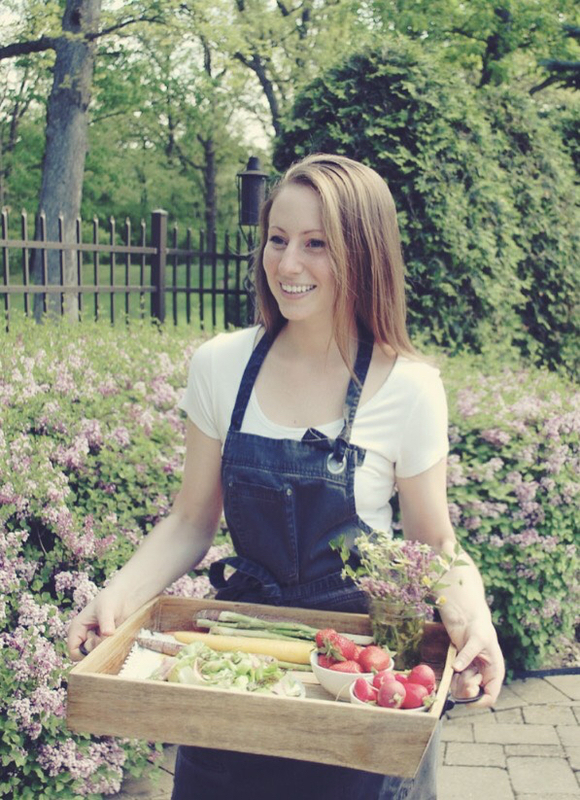 I like making it on the weekends…the perfect time to indulge!